We can add a short description in the Description tab. 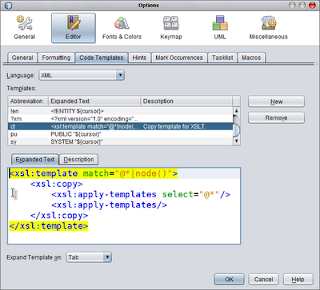 Let's type Copy template for XSLT. Finally at the bottom we see Expand Template on. Here we can define which character NetBeans will react to after we type ct in an XSL stylesheet to expand the template code. Let's leave it to the Tab character. Now when we return to the NetBeans code editor and we are working on a XSL stylesheet, we can type ct, press the Tab key and we get the complete code inserted into our stylesheet.